THE NEXT TALK WILL BE ON 16th JANUARY 2019. Mr. STEVE GEALE WILL TALK TO US ABOUT “STAFFORD GAOL”. THERE HAS BEEN SOME CONFUSION ABOUT NOVEMBER’S TALK. “ANNUAL EXHIBITION” FOR THIS YEAR. A very poignant subject given the upcoming commemorations and well worth seeing. MEET & CHAT TO FRIENDS, OLD & NEW AND SOCIETY MEMBERS WILL BE ON HAND TO HELP WITH ANY VILLAGE HISTORY QUERIES YOU MAY HAVE. PLEASE PASS THIS ON TO FRIENDS AND NEIGHBOURS WHO MAY NOT HAVE ACCESS TO THIS SITE. 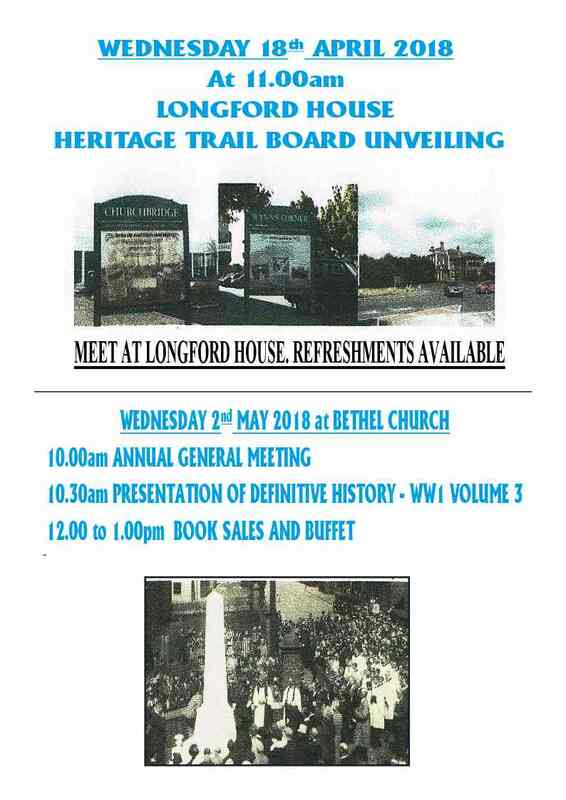 IN CONJUNCTION WITH BRIDGTOWN PARISH COUNCIL THERE WILL BE A DEDICATION OF THE LATEST HERITAGE TRAIL BOARD AND A MEMORIAL BENCH FOLLOWED BY REFRESHMENTS IN THE BETHEL CHURCH. with descendents of Ma’s family in attendance. VOLUME 3 – WORLD WAR ONE AND IT’S EFFECTS ON BRIDGTOWN. Although they will not be published in order, we hope to publish one every 4 months and they will develop into a complete history of Bridgtown in 6 VOLUMES. NOW ON SALE : CONTACT JOHN DEVEY, DAVID WILLIAMS OR ONE OF THE TEAM. 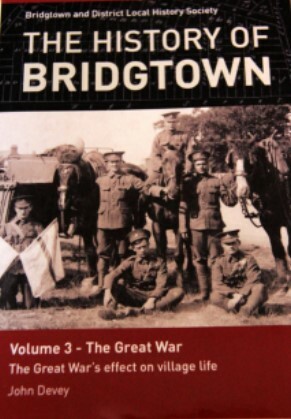 SALES OF NEW BOOK – THE DEFINITIVE BRIDGTOWN – VOLUME 3 – WORLD WAR 1 AND ITS EFFECT ON VILLAGE LIFE. A panic ensued on Monday morning when, due to circumstances beyond our control, the board frame was still at the painters and the text boards still at the printers. Tuesday afternoon and the board still not in place. 10.00am Wednesday arrived and it was all in place with no sign it had been rushed. A great job by the maker of the board ( Although it gave all the team palpitations for a while) A steady stream of folks arrived at the board and the unveiling went of well with Barbara Battersby removing the flag cover. Unfortunately, Marion Glover, who was due to unveil the board was not well enough to travel, but Barbara stepped into the breach. Hopefully, Marion, you will be well soon. 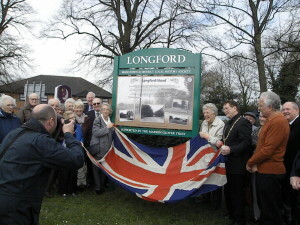 With the Council members, our President Fred Pritchard, Malcolm Podmore(Chairman, Cheslyn Hay & District Local History Society) the unveiling attracted 40 plus even though the weather wasn’t brilliant. After the event coffee & biscuits was to be had in Longford House. Keep an eye open for the newspaper reports in the Express & Star & Cannock Chronicle. The Coffee Morning today was not a great success. There were more Team members than normal members. However, a few of our film archives were shown and a few ideas for the future were bandied about. Maybe folks were away with it being Easter week but we could do with your support. These events need the volunteers to feel they are doing something worthwhile. 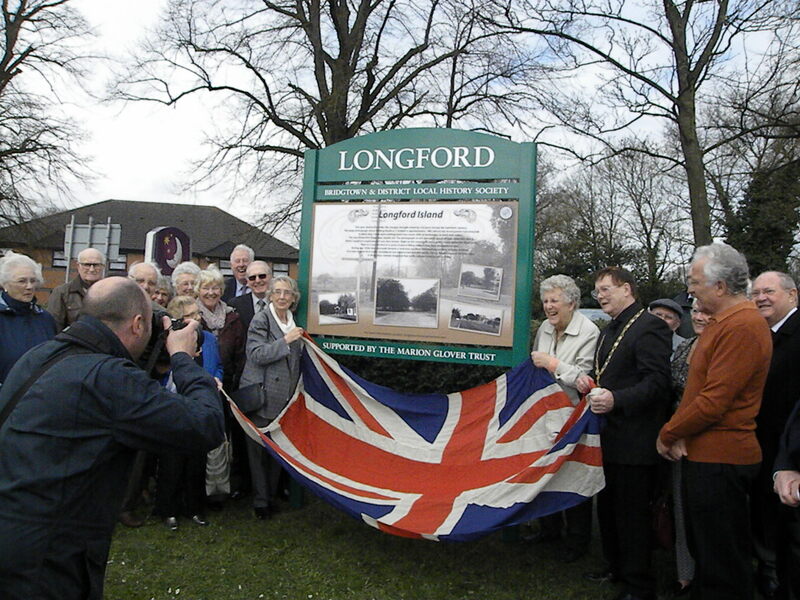 Our next meeting is the unveiling of our fourth Heritage Board at Longford House. This is being attended by Marion Caine who kindly sponsored the board and will being coming up from Hereford. She will be accompanied by the wife of the late David Battersby, Barbara. David was responsible for much of the Gilpin history in the hands of Barbara and the Society and Longford House was the home of William Gilpin and his family. We will try to come up with something that would be interesting for you but we need your input and the next time we meet at the Bethel for our AGM would be a good time to come and let us know what you would like us to do. 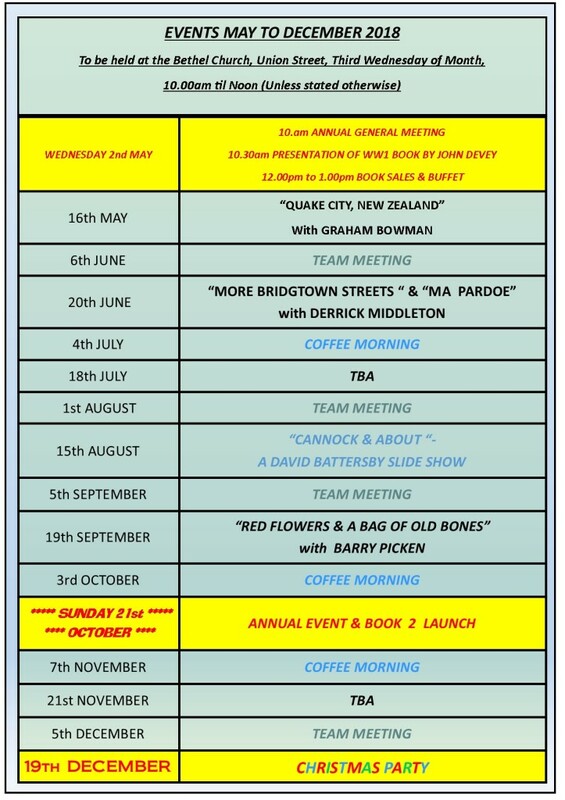 Also, there will be a presentation by John Devey of the first released volume of the “Definitive History of Bridgtown”. It is volume 3 of the set and the other volumes will be released as they are finished by various team members. It goes without saying that the amount of time taken to write these tomes depends on the depth of the subject and the time required by the authors amongst their other interests. All of us are volunteers. The morning will end with the sales of the book and a buffet will be provided. Hope see more of you there. 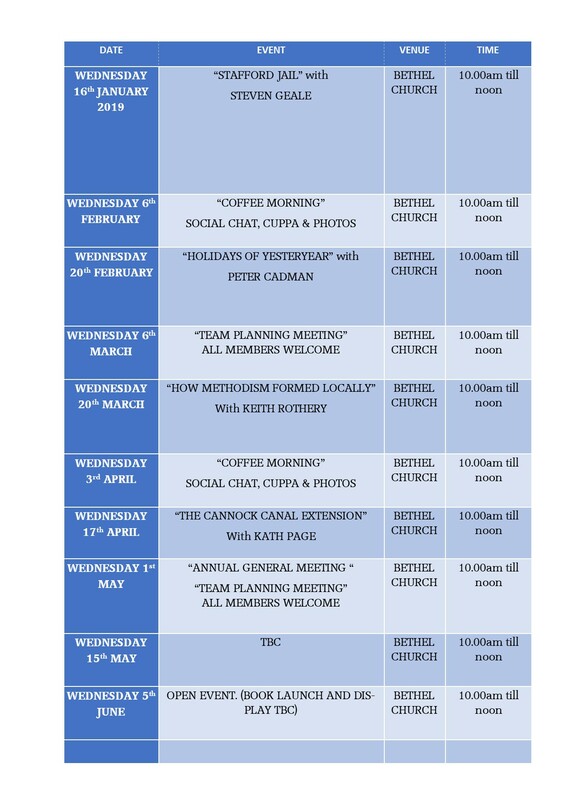 2nd May – Bethel, AGM and book launch. 10.00 am AGM. 10.30 Presentation on new book and its ideals about the full story of Bridgtown. Sale of books follows. 12.00 – 1.00 pm. Buffet lunch. The loss of David Battersby has hit us all hard. We must now remuster and take the Society forward to the goals we set when he was around. With this in mind, our next team meetings will need to discuss the future of the Society and a coherent plan must be formed to meet our needs. 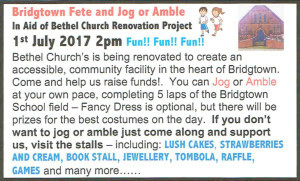 If any members have ideas about how the Society should proceed and wish to help out in any way – the next team meeting will be held at the Bethel Church on wednesday 7th March 2018 at 10.00am and all are welcome. The next monthly talk on 21st March 2018 at 10.00 at the Bethel will be given by Derrick Middleton and will be the streets of Bridgtown not yet covered and also a history of a Black Country legend known as “Ma Pardoe” who was born in Bridgtown in the 19th century.Derrick is hoping that some members of the Pardoe family will attend the talk. It has been a hectic couple of months. 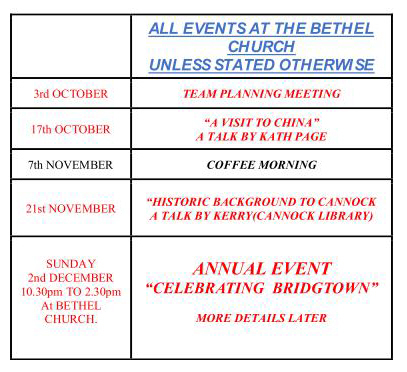 Reinstalling at the Bethel, preparing the Annual Event, John Devey’s Talk on “the walk into Cannock” and the unveiling of the latest Heritage Trail Board at Wynn’s corner. 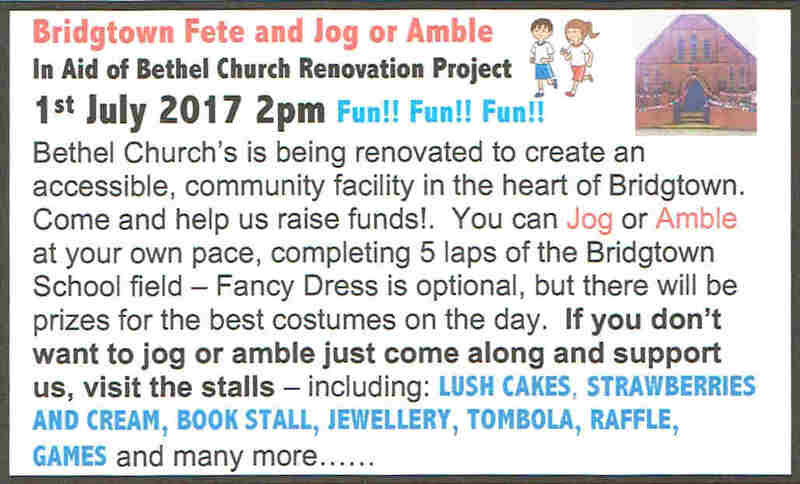 The Bethel, although not yet finished, is looking great, well worth a visit. Preparation of the displays and films for the Annual Eventis taking up members time but we should be ready for the big day! 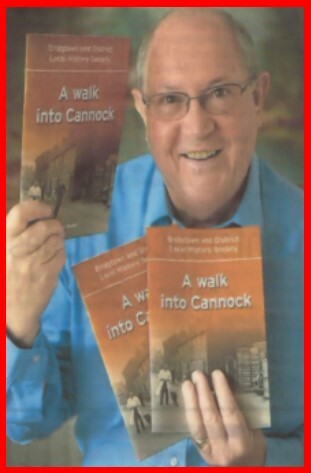 John’s talk was a sweetener for the launch of the new book ” A Walk into Cannock” and went down well with a good audience. The unveiling of the Heritage Trail Board on Wynn’s Corner ( for the uninitiated, corner of Watling Street & North Street) was also well attended having met at the Bethel prior to the unveiling. Speakers from the Cannock District Council, Bridgtown Parish Council, the vicar of the Bethel, as well as David Williams, Derrick Middleton, former Chairman of the Society Tony Pearson, Peggy Greenway. After the unveiling, it was back to the Bethel for refreshments. 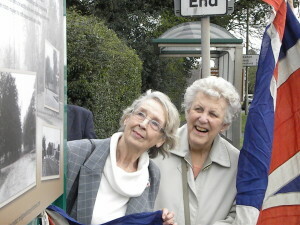 BERYL HOLT WILL BE TALKING ABOUT “BROCTONLAGER” A GERMAN PRISONER OF WAR CAMP. PLEASE REMEMBER ITS ONLY 2 MONTHS TO OUR ANNUAL EVENT AT THE BRIDTOWN SOCIAL CLUB. THE THEME IS “A WALK INTO CANNOCK” AND WE ARE CHARTING THE AREAS BETWEEN BRIDGTOWN & CANNOCK. ITS A WALK MOST OF US HAVE TAKEN OVER THE YEARS AND WE HOPE TO BRING BACK THE RELATIONSHIP WITH THE TOWN WHICH IS THE CENTRE OF WORK AND COMMERCE. NEXT MONTH’S TALK 20th SEPTEMBER 2017 AT THE BETHEL, WILL BE BY JOHN DEVEY AND IS A TASTER FOR BOTH THE ANNUAL EVENT AND THIS YEARS BOOK. 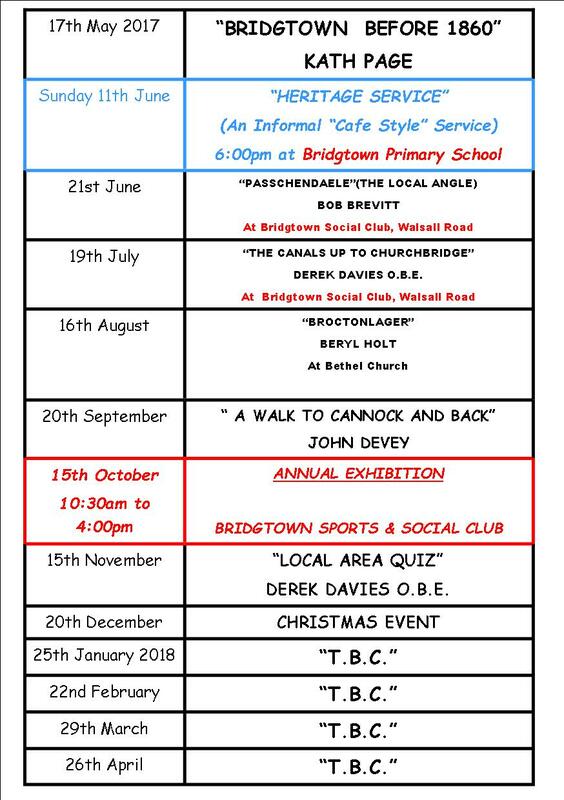 The next talk will be on the 19th July 2017 at the same venue – BRIDGTOWN SPORTS & SOCIAL CLUB – and will be entitled “THE CANALS UP TO CHURCHBRIDGE with MR. DEREK DAVIES OBE. This months talk went quite well, with a fair audience considering the venue change and upheavals. With help from the team and specifically John Devey & Peter Cadman from the Cheslyn Hay Society, the speaker got through the ordeal wthout any major hiccups. Updating the events : the talk on WEDNESDAY 21st JUNE 2017 – PASSCHENDAELE- THE LOCAL ANGLE by BOB BREVITT will commence at 10.00am at BRIDGTOWN SOCIAL CLUB, WALSALL ROAD (which is where we hold the Annual Exhibition).